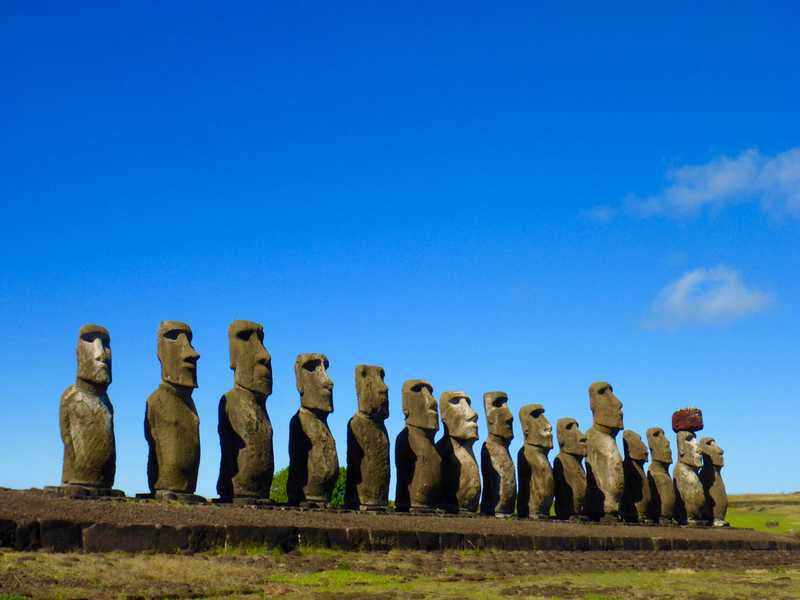 Everything you know about Easter Island is probably wrong. At least it was for me… A mysterious civilization who built massive statues and suddenly, unexplainably vanished from existence, right? And those statues were of giant faces on hillsides looking out at the ocean, right? Pretty much everything I knew was wrong, but here are my five favorites. 1) Myth: The civilization that created the incredible and huge stone sculptures (called Moai) became extinct and nobody knows why. Agostin Trip Truth: Nope, definitely not an extinct society. 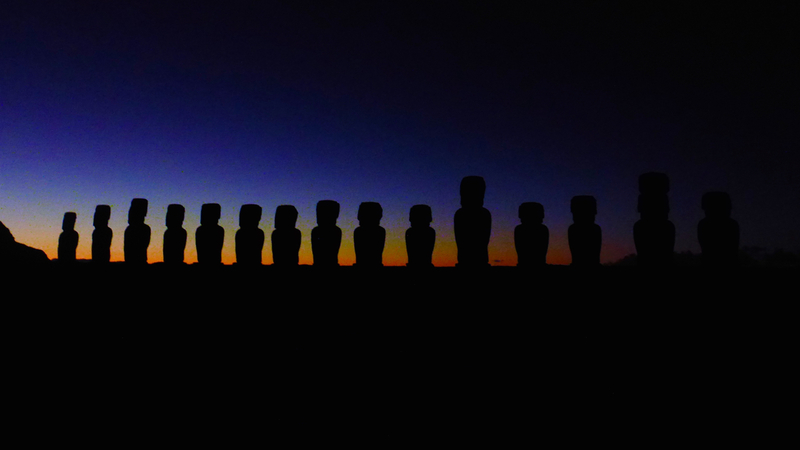 The society is the Rapa Nui people. And I met and hung out with a lot of them! So I’m not sure what scientist has gotten that fact screwed up. And when I asked my Rapa Nui friend about how she doesn’t exist, she laughed good heartedly as she’s heard it before, but was floored! Rapa Nui are awesome, everyone we met was kind and super funny, and felt much more Polynesian than any South American people. 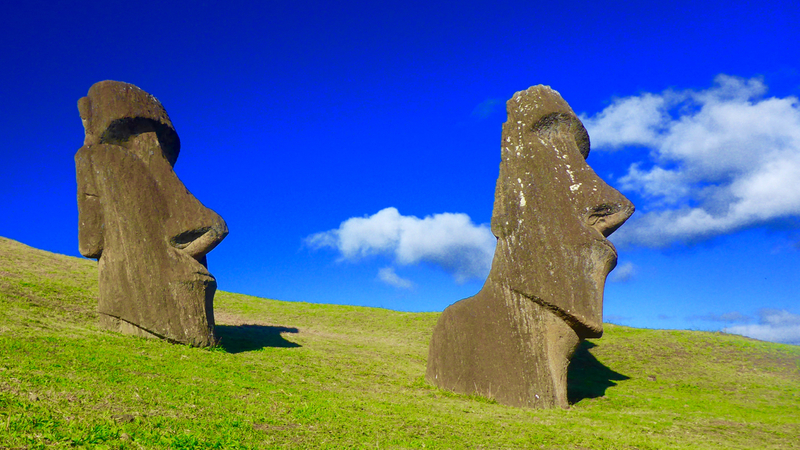 So there ya have it – Easter Islands ancient people are not extinct. And here’s the picture to prove it! 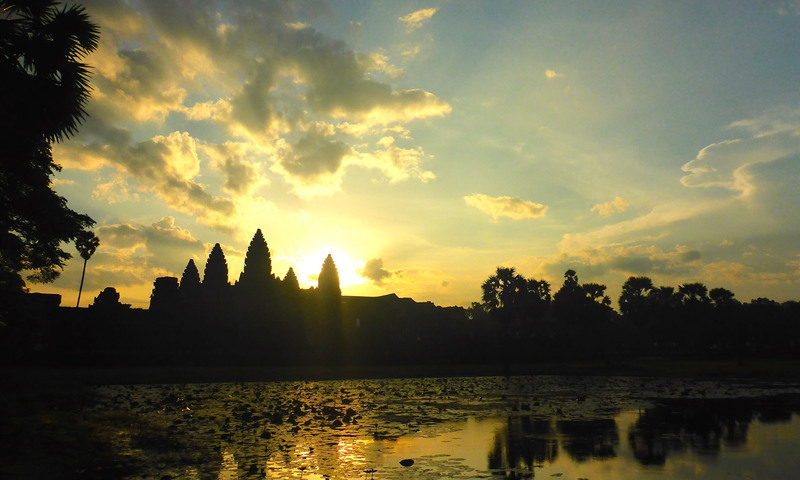 2) Myth: …and this population went extinct because of poor resource management – like cutting down all of the trees to build more statues, not taking care of the land in this race to build more statues. Agostin Trip Truth: again… “I’m not dead yet!” So while the society still exists, there have been a lot of changes, as there would be in any society. They don’t build the Moai any more. But the reason isn’t a lack of resources, it’s that their ancestral beliefs changed from mainly worshipping the giant stone images of their important ancestors, to worshipping Birdman and the power he brought. Every year there was a contest to see who would be the Birdman for the year and be the supreme ruler/deity which involved swimming to a island and climbing up rock walls to find bird eggs. And after Birdman came tribal fighting across the island and the catholic missionaries. We went on a couple tours of the island and saw how these changed beliefs were acted out completely differently and in different areas leading to a change in priorities. 3) Myth: These infamous, super photographed, NatGeo cover statues are hundreds of giant faces on hillsides looking out at the ocean. Agostin Trip Truth: The Moai are actually full body statues of a specific ancestor. They were made in quarries in the middle of the island, but they had to be transported by the family to the coastline nearest where the family lived. They would have a ceremony which brought the Moai to life so it could protect the family, bring them good crops, many children, all that stuff. It always had to face the family, and drew power from the sea behind it. TOKHAHI It turns out the most frequently photographed couple of Moai are a couple of unfinished ones that were still being carved when the carver quit so they still sit on the quarry. But honestly I think these are still my favorites. 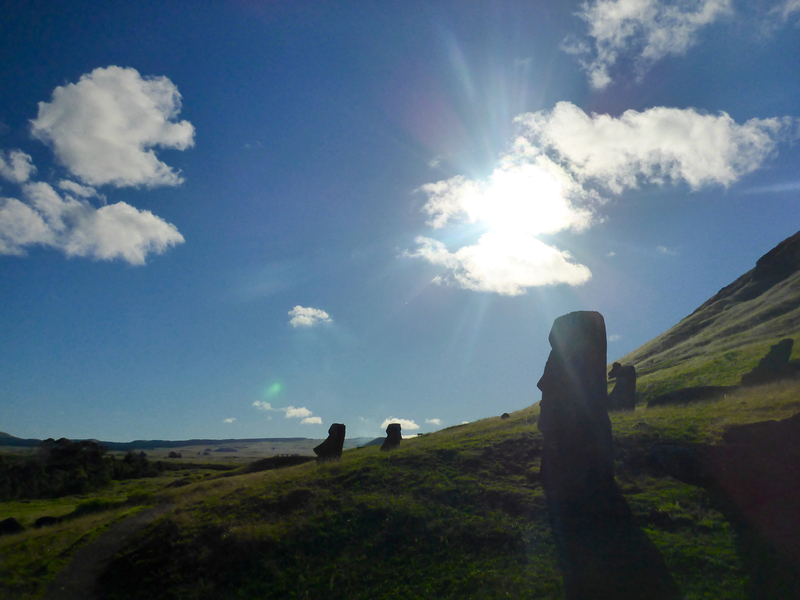 We rented a vehicle with a friend for a day to drive around the island and got really fortunate to be the last people of the day in the park with these Moai. It was magical, you could feel yourself being pulled back in time. 4) Myth: Most of the statues are still standing. Those that aren’t were victims of a great war for resources between the Rapa Nui. Agostin Trip Truth: actually every single statue on the island was knocked over and broken. In the last 20-50 years about two dozen of the hundreds have been put back up. The Rapa Nui people just didn’t believe in the Moai any more, there was this new Birdman dude on the scene, so if a tsunami hit them, no big deal, or if they were a causality in a war between families, not worth fixing. But the biggest downfall of any remaining was colonization. Various European countries started “discovering” Easter Island. In these visits they would take proportionally huge numbers of slaves back to their South American colonies or Europe (decimating the Rapa Nui population), take the women as their own and bring disease. 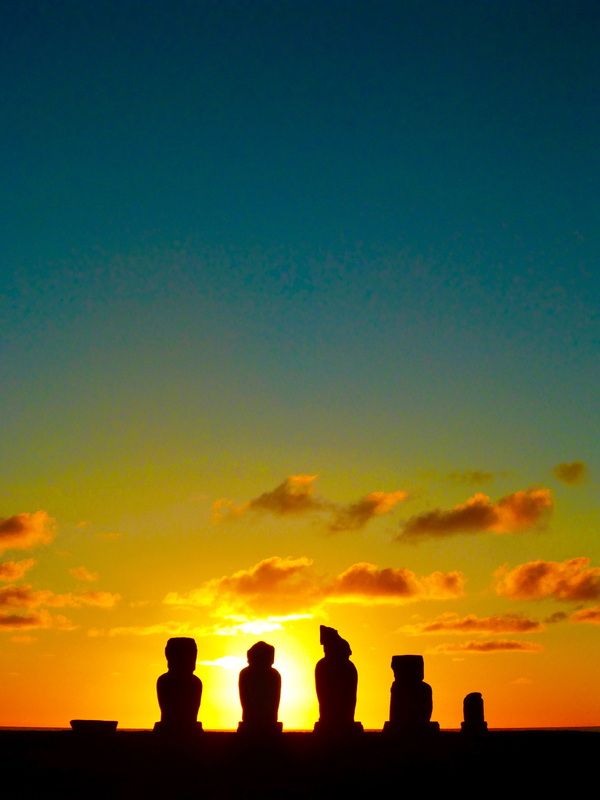 The Rapa Nui began to see that the biggest point of interest bringing these Europeans to the island was the Moai. So the Rapa Nui tore down all remaining statues, hoping this would keep away the looters of their island. This is relatively recent history folks, like late 1800 early 1900’s. 5) Myth: The statues are the coolest thing on the island. Agostin Trip Truth: (ok, warning, this one may be rather biased) Easter Island is lush and green with rolling hills that flow into deep sapphire water with powerful waves. And it’s the perfect home for the islands 4,000+ wild horses!! HORSE ANAKEEMA VID Get your head wrapped around that, 63 square miles and 4,000 wild horses, not counting the domesticated ones. They are absolutely beautiful and everywhere… In town, at the historic sites, running across meadows, on the beaches. Being in such a horsey place, I could resist going horseback riding. We enjoyed a spectacular ride up to the highest point of the island, and could see the entire island and the ocean all the way around. 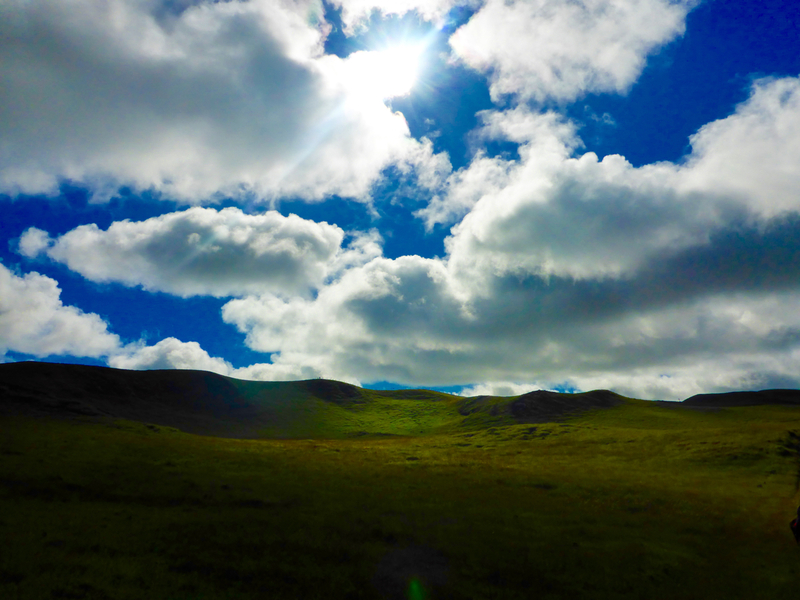 I got to gallop through lush fields next to the wild horses, and into eucalyptus forests, and up to a volcano crater. Walking around town we ran into a local fisherman with his catch from the night before and it looked so amazing we couldn’t pass it up, even through we were camping at a hostel and would have to prepare it there. The first day was beautiful red snapper. It became our ritual and we scored an incredible piece of fresh off the boat tuna, and another time a buttery local fish I can’t remember the name of. All excellent. Things weren’t cheap on the island, so it necessitated that we camped while there. We got to camp in this grassy patch right by where the waves crash into the volcanic rock formations. Waking up to that view and going to sleep to that sound was fantastic. 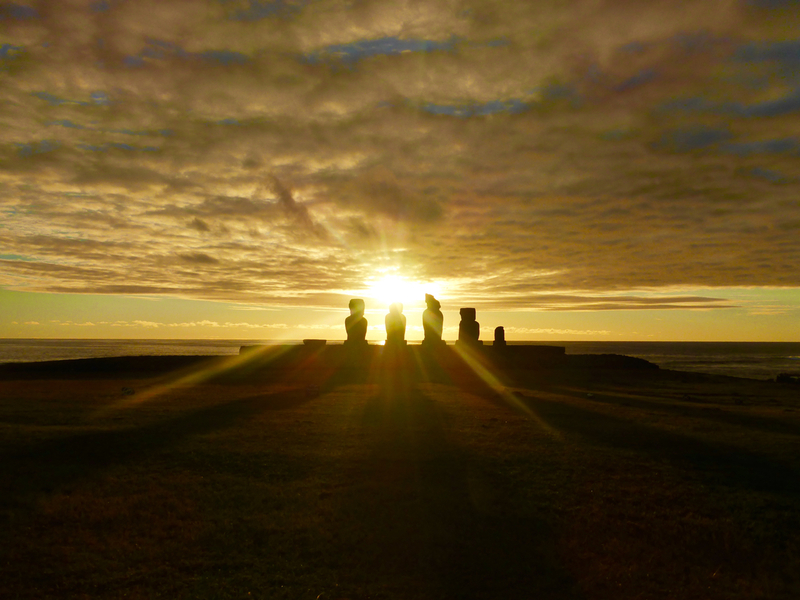 Easter Island is an incredible little triangle of bliss. Interesting, relaxing, authentic. Not touristed out like you’d imagine. And know I have a completely different idea of the society there, it’s people then and now as well as the Rapa Nui story! 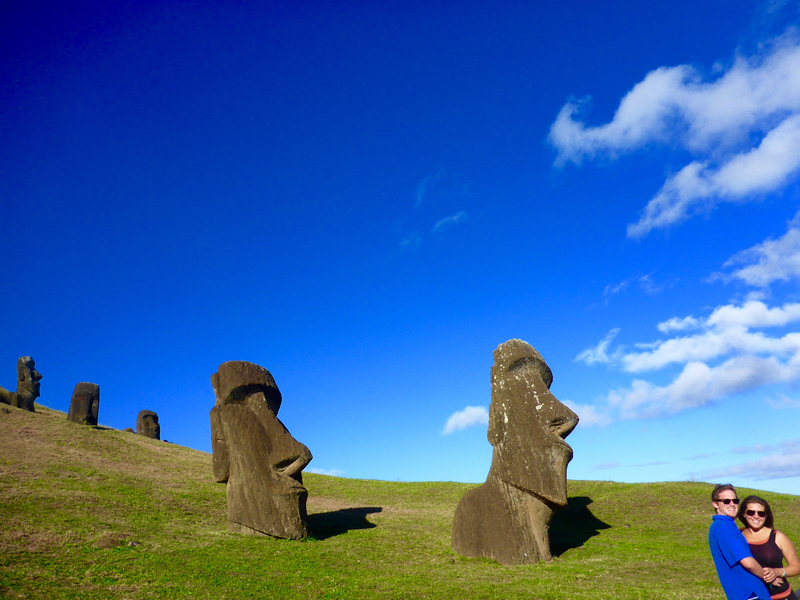 @Liz_B_A says: Everything you know about Easter Island is probably wrong. So the Easter Bunny doesn’t live there? Where are U guys heading to next?